How do people find time to bake during the week? In my world, baking is usually a weekend only activity because I just can not make the time to rock out the cookies, cakes, and other sweets after a full day of work. My patience and attention are spent by the time I get home and baking is not something you want to only sort of pay attention to. When I’m not paying full attention I do things like mix up baking soda and baking powder, or intend to scale a recipe down but don’t think through all the steps and put in half the sugar but all the flour. If I’m going to be producing baked goods on a weeknight, it better be an emergency, and the recipe better be Wendiproof. I just so happened to find myself in a situation during the week where cupcakes were called for and I had what turned out to be a Wendiproof recipe at my disposal. And let me tell you something, you NEED to have this recipe in your repertoire. I don’t think I’ve ever said that about anything. But these cupcakes and marshmallow buttercream frosting are the perfect solution to any baked good emergency that you could encounter. The method is beautifully simple, the ingredients are pantry staples, and the results are amazing. This recipe will wow people into thinking you slaved away in the name of cupcakes. The truth, that these cupcakes nearly make themselves, can stay our secret. Heat the oven to 350 degrees and line a muffin tin with paper or foil liners. Whisk together the flour, cocoa, sugar, baking soda and salt in a medium bowl until well combined. Combine the water, oil, and vanilla in a measuring cup or small bowl and add to the dry mixture. Add the egg and stir until blended, about 1 minute. Using an ice cream disher, fill each liner about 3/4 full of batter. Bake for 19 to 20 minutes or until a toothpick inserted in the center comes out cleanly. Let cool in the pan for 10 minutes before turning the cupcakes out and placing them on a rack to cool completely. BAH Note: This may become my favorite, go to frosting. It is ridiculously easy to make, the texture is exquisite, and even I managed to pipe it decently. Although I’d like to see what happens if I reduce the amount of butter down to a stick or maybe a stick and a half. Two sticks of butter gives you a very rich frosting. Not that it’s a bad thing. I bet that if you had a mind to fill your cupcakes as well, this frosting would oblige. Combine the butter and marshmallow in the work bowl of a stand mixer fitted with the paddle attachment. Beat on medium until completely smooth. Reduce speed to low and add confectioners sugar, vanilla, and salt. Continue to beat until smooth and fluffy. I just discovered a fantastic weeknight baking recipe last night–I hope to share it next week! After a long day, an hour and 20 minute commute (thank you, bus fire in the tunnel) and a workout (yes, I’m a slave to my half marathon training plan) I needed something relaxing, and that’s what baking is for me. As for this recipe, it’s going in my file of emergency recipes. Because you never know when the urge may strike. Beth, I find weeknight baking to be anything but relaxing but I’m intrigued to see what you’ve got up your sleeve. When I was asking you before about frosting tips, I wanted this to be a bigger,softer swirl but I feel like the tip I had was a little small. Does that make sense? Do you know what size tip you were using? I tend to not like the way a round open tip looks when piped out. I like open stars or starbursts, but that’s just me! Beth, I’d have to check and see what size that tip is. What I like about the open tip is that I think it is more forgiving for inconsistent frosters like myself. I love Abby!! A lot of the recipes in Desserts 4 Today are weeknight easy and Wendiproof too, hee hee. I am fascinated by this frosting. I don’t usually like fluff very much, but maybe whipped up with some butter I could deal! Jennifer, you don’t notice the flavor of marshmallows from the fluff. But it does a lot for the texture of the frosting. For an easy vanilla frosting, I think this may become my go to. And really, you would be frightened to know how wrong I can get a recipe on a weeknight. Kathy, I think the fact that you want to make them is reason enough. You don’t technically have to have an emergency but if you do, these should easily get you out of it. I’ve never made cupcakes in my life because they require frosting and that’s just too fussy for me. Plus, the two of us can’t possibly eat a batch of them before they get stale, so I need a reason – like a party. That said, I decided that going to my MILs this weekend would constitute enough of a party and made a batch of cupcakes using the marshmallow buttercream. I used 1.5 sticks of butter rather than 2 and it was plenty rich and delicious. I think this will become my go-to frosting recipe for those rare occasions I make cakes. Buttercream is the only type I think is worth eating, anyway, and not having to deal with sugar syrup is a real plus. Kathy, I’m thrilled to hear that you made the Marhsmallow Buttercream. I like that even with cutting back the butter, the frosting is still rich. I’m going to have make a note on my recipe to definitely start with less butter. Or conversely, I could be happy to watch them get fat from eating cupcakes and cookies and baked goods. pls don’t hate me but j’adore weeknight cooking and baking. i quite literally step in the abode, put my purse down and head straight to the kitchen to make dinner. despite working all day and sometimes even squeezing in a 90 min bikram session, playing with food in the kitchen is an absolute must to end my day. you’re right, the cupcake ingredients are pantry staples. however, i’ve never worked with marshmallow fluff before, never even tasted it. but the way the icing looks on the cupcake makes me want to at least give it a whirl. Lan, I admire folks that can put in a full day and still have the focus and energy to come home and dive into cooking and baking. I’d be interested to see what you think of this frosting after you’ve taken your buttercream classes. Finally. A recipe that justifies not my want but my unequivocal NEED for baked goods in order to live. Your emergency cupcake is brilliant and deserves a little emergency glass case made of poured sugar. Ali, these may be a little low-fi for your mad baking skills but they are brilliant. My hat is off to @abbydodge (go look her up on twitter, she’s fantastic). I love the idea of a poured sugar emergency glass case. Totally sounds like something you’d see on one of Food Network’s “Challenges”. Both of these recipes sound amazing (I guess that’s to be expected coming from Abby)! Can’t wait to try. Tracy, you have to try these. They are must make cupcakes! This is like those donut thingys younger sister – where have you been all my life?!?! Starred in the reader. For a rainy day when my pants fit better. Brooke, you need to show these cupcakes some love STAT. Because I’ve decided that waiting until the pants fit better to do anything never works out as well as you think it will. As cute as I look baking in my sweatpants, I don’t think my co-workers want to see don elastic waistbands at work. I seriously need to start working out. Because I’m a hoss. Boo, maybe you could make these cupcakes and take them to the office for the coworkers. Keep one for yourself and let the rest go. That’s what I do. Else I would be big as a house. Wendi, nice job piping the frosting! These cupcakes look so professional. And I love the idea of marshmallow frosting; it sounds like it shakes things up, while still keeping the cupcake simple. Jen, I think with a larger tip the frosting would have looked more billowy and cloudlike. So I need to find one. The genius of the marshmallow in the frosting is that it gives it wonderful structure but you don’t taste it. Thanks Anna, I was really proud of the way these turned out. I am not known for my frosting skills so to have them look so pretty was a huge win. 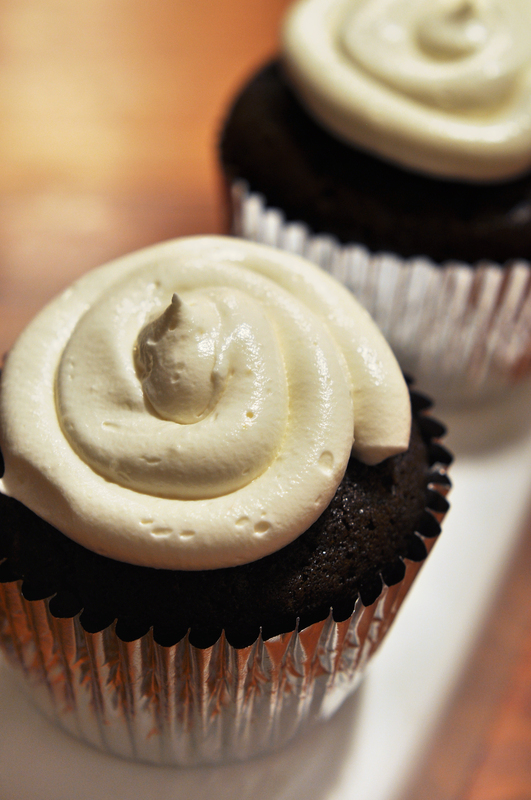 I used this frosting as a filling in my chocolate whoopie pies, they were a huge hit! Thanks! Really? That’s fascinating because I haven’t found a whoopie pie filling that I’m happy with. I hope that you’ll post your whoopie pies so we can all enjoy them. Here’s my recipe for Chocolate Whoopie Pies with Peanut Butter Filling. I did half peanut butter and half using this marshmallow filling. @PGF, these are going on my list of things to make soon. Funny, I printed a whoopie pie recipe earlier today. I feel like I’m being stalked by whoopie pies today ; ) Thanks for the tip on subbing marshmallow for some of the peanut butter. Maybe instead of baking my husband a birthday cake, I’ll make him these! Brilliant. Ohhhh these are going on my must try list. Yum! Kristen, these cupcakes are super easy and the frosting is unbelievable. I love how the marshmallow gives it great body but it’s not marshmallowy. That Abby Dodge is one smart cookie. Someone was tweeting yesterday about a blender cupcake of Abby’s. I need to go search her site for the recipe. I made the Emergency Cupcakes last night, but had no frosting to top them with! They were so simple. I love that the recipe only made 12 cupcakes. So much easier to deal with than the 24 that come out of a cake mix. Should the butter in the frosting be unsalted? My attempt last night was SO salty! I used salted butter because that’s what I had and I added the salt called for by the recipe (maybe I shouldn’t have done that). I put it in the fridge in the hopes of saving it today by adding more sugar (which I ran out of). We’ll see what happens! Mrs. Rev, naked cupcakes need love too! And yes, I find 12 cupcakes much less menacing than 24. I always use salted butter when I cook and bake. I didn’t find the frosting to be salty even when I added the 1/4 teaspoon salt called for. Did you use regular (table) salt or kosher? But to answer your question, you would have been ok to omit the salt since you used salted butter. Let me know how it goes when you add additional sugar. You may also need to throw some more fluff into the bowl as well. By the way, there was a comment earlier that cutting back the butter to 1 1/2 sticks still produced a rich frosting. So next time, and I hope you will give this frosting another chance, try starting with less butter and omitting the salt (unless using unsalted butter) and see if you’re happier with the result. I made these on Christmas to bring to my folks’ house. When I walked in, I still had icing in my hair from eating what was left there after I frosted the cakes. I was roundly mocked but maintained my dignity, knowing that the dessert would vindicate my marshmallow buttercream based inattention to my appearance. They did not disappoint. I left with my head up. On the way home, I ate the extra cupcake I’d removed from the platter and hid in the car during the drive down. The power of the marshmallow buttercream is strong Omawarisan. Only those who do not know the power mock. And then they eat their words. I just wandered over here from Blurt’s blog…those cupcakes look so good! Thanks for clicking through from Blurt. I can only imagine the stream of consciousness conversation that goes on in his head. I don’t cook, or bake but when I saw the word marshmallow fluff on Blurt—well I just had to come over and see what I was missing. These cupcakes look like a possibility. I might be able to make them…I hear a faint voice in my head saying…oh go ahead and try…nothing is as evil as a Rice Krispie treats and you made those once. I’m going for…I came, I saw, I will cupcake. Thank you. I’m glad the Jolie made it and I’m sorry about the Monkey incident. Katybeth, these cupcakes and frosting are ridiculously easy. And you won’t end up with marshmallow goo all over your hands…unless you really want to or you do a really messy frosting job. We had to send Sock Monkey off for some professional help after The Jolie left. The doctors assure us that he’s resting comfortably. Pingback: Rants in Your Pants? I did not make the icing, because there is no such thing as room temperature butter in my kitchen this week.. but maybe next time! I just made these last week and forgot to take the butter out to soften. I like your solution of straight marshmallow fluff to top them but what I did was take the butter out of the wrappers and put in a microwave safe bowl and then cooked for 30 seconds on 10% power. The butter softened enough to combine with the fluff in the mixing bowl but did not completely melt. I want to make these for a birthday party. Do you know if I can premix the frosting and keep it in a ziplock bag in the fridge or will that ruin the consistency? I don’t see why you couldn’t make the frosting ahead of time. My question would be how long it would be sitting in the fridge? A day shouldn’t be a problem. You might even be able to get away with two if you put a layer of plastic wrap against the surface or put it a ziplock and squeeze out all the air. You would definitely want to let the frosting come up to room temp before you try and use it though. I was thinking about making the frosting the day before and frosting the cupcakes the day of the party. I would just hate to do it an have it mess up without a backup :). I guess its not too time consuming to do the day of though if I need to run out and buy more stuff. I say that you could bake AND frost the cupcakes the day before.� In fact, I say you SHOULD do it the day before and just check that off your list.� The frosting is ok not to be refrigerated for a day. Now you’ve got me wanting to make a batch of these. LOVE how your frosting piped with a star tip.� I will have to remember to dig mine out the next time I make these. And I also reduce the amount of butter in the frosting to 1 or 1 1/2 sticks. Did you ever try the frosting recipe with less. Utter as you suggested? I have reduced the amount of butter to cut down on the richness. If you start with less, you can always mix more in if you want it more luscious.